In the landmark Paris Climate Agreement, the world’s nations have committed to “holding the increase in the global average temperature to well below 2 °C above pre-industrial levels and to pursue efforts to limit the temperature increase to 1.5 °C above pre-industrial levels”. This goal is deemed necessary to avoid incalculable risks to humanity, and it is feasible – but realistically only if global emissions peak by the year 2020 at the latest. Let us first address the importance of remaining well below 2°C of global warming, and as close to 1.5°C as possible. The World Meteorological Organization climate report[i] for the past year has highlighted that global temperature and sea levels keep rising, reaching record highs once again in 2016. Global sea ice cover reached a record low, and mountain glaciers and the huge ice sheets in Greenland and Antarctica are on a trajectory of accelerating mass loss. More and more people are suffering from increasing and often unprecedented extreme weather events[ii], both in terms of casualties and financial losses. This is the situation after about 1°C global warming since the late 19th Century. Not only will these impacts get progressively worse as warming continues, but our planet also runs a growing risk of crossing critical tipping points where major and largely irreversible changes to the Earthsystem are triggered (see Fig. 1). Fig. 1 Tipping elements in the Earth system, in relation to past global temperature evolution since the last Ice Age 20,000 years ago as well as future warming scenarios[iii]. 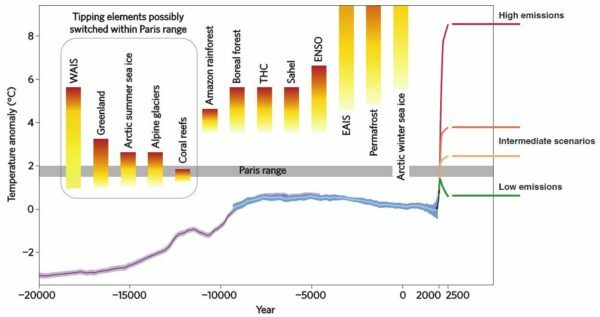 The Paris range of 1.5 – 2 °C warming is shown in grey; the bars show increasing risk of crossing tipping points from yellow to red. The West Antarctic Ice Sheet (WAIS in Fig. 1) has likely already been destabilised, committing the world to at least three meters of global sea-level rise in coming centuries[iv] – an outcome that scientists have warned about since the 1970s[v]. The Greenland Ice Sheet – holding enough ice to eventually raise global sea levels by seven meters – may likewise be destabilised below 2°C[vi]. Coral reefs have suffered pan-tropical mass bleaching in 2016 and are doing so again in 2017 as a result of warming oceans, and only if global temperature stays well below 2°C some remnants of the world’s coral reefs can be saved[vii]. The Gulf Stream system (THC in Fig. 1) appears to be already slowing[viii] and recent research indicates it is far more unstable than previously thought. Because overall global temperature rise depends on cumulative global CO2 emissions, the Paris temperature range can be translated, with some uncertainty, into a budget of CO2emissions that are still permissible. This is the overall budget for the century and it lies within the range of 150 to 1050 Gt of CO2, based on updated numbers from IPCC[ix]. At the current global emission level of 39 GtCO2 per year, the lower limit of this range would be crossed in less than four years and is thus already unachievable without massive application of largely unproven and speculative carbon dioxide removal technologies. Even the CO2 budget corresponding to the mid-point of this uncertainty range, 600 GtCO2, is equivalent to only 15 years of current emissions. Fig. 2 illustrates three scenarios with this budget and different peaking years for global emissions. It makes clear that even if we peak in 2020 reducing emissions to zero within twenty years will be required. 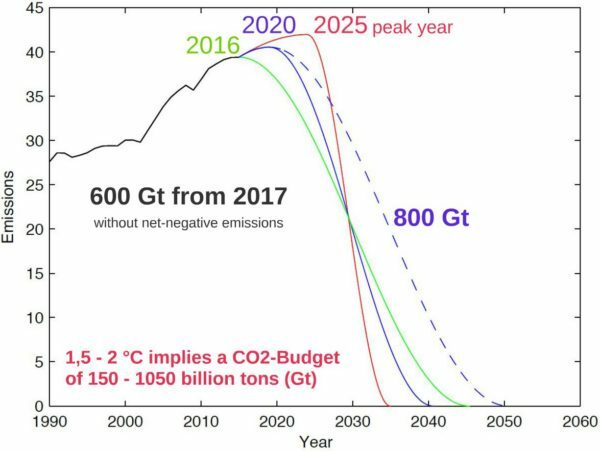 By assuming a more optimistic budget of 800 Gt this can be stretched to thirty years, but at a significant risk of exceeding 2°C warming. It is still possible therefore to meet the Paris temperature goals if emissions peak by 2020 at the latest, and there are signs to show we are moving in that direction as global CO2 emissions have not increased for the past three years. We will need an enormous amount of action and scaled up ambition to harness the current momentum in order to travel down the decarbonisation curve at the necessary pace; the window to do that is still open[x]. In summary, declining carbon emissions after 2020 is a necessity for meeting the Paris temperature limit of “well below 2 degrees”. Fig. 2 Three illustrative scenarios for spending the same budget of 600 Gt CO2, with emissions peaking in 2016 (green), 2020 (blue) and 2025 (red), and an alternative with 800 Gt (dashed). [i] World Meteorological Organisation. WMO Statement on the State of the Global Climate in 2016 (WMO, Geneva, 2017). [ii] World Meteorological Organisation. Weather extremes in a changing climate: hindsight on foresight (WMO, Geneva, 2011). [v] Mercer, J. West Antarctic ice sheet and CO2 greenhouse effect: a threat of disaster. Nature 271, 321-325 (1978). [ix] Peters, G. How much carbon dioxide can we emit? (2017) http://cicero.uio.no/en/posts/climate/how-much-carbon-dioxide-can-we-emit. Concerning CO2 emissions over the last three years, as I understand it, the latest estimates for emissions from energy show a slight increase over those three years but this gets reported as “stalled”, which isn’t technically correct. Final figures for those years are some way off, so it would be better to say that “the increase in global CO2 emissions from energy appear to have slowed almost to a stop for the past three years”. But what is the picture with other causes of emissions and with other GHGs? Is there any sign of the slowdown in the rate of growth of these gases in the atmosphere? I’m still trying to figure out why some scientists claim that a 2C limit is still possible. The 1C figure is usually mentioned as “about 1C” but isn’t the real figure closer to 1.2C after three record breaking years? That is after an approximately 40% growth in CO2 since the industrial era started. More warming from that increase is still to come and we’re adding more. However, aerosols are masking as much as 0.5C (or is it more? ), so removing those would already see us well over 1.5C. But with more emissions to come, is it reasonable to think that there is even a slight chance of staying under 2C? And I haven’t even mentioned CO2e, which is already well above what was regarded as the limit for 2C. That was 450 ppm CO2e but we’re over 485 ppm CO2e. Well, in three years it will be time to elect a new president. After we get rid of the current one, we can start on a concentrated program of…getting rid of all the other anti-science folks in Congress. And when we get that done (should only take a few years) we can buckle down and get on with the business of reducing carbon emissions and fighting climate change! Oh, wait, three years from now…that’s 2020 already…right? Yes, we are talking centuries. To put things into perspective, 200 years ago Napoleon lost at Waterloo. 110 years ago model T was out, and it became evident that global ban on horse manure was not necessary. Future predictions rarely turn true, but do you seriously believe that fusion folks won’t get their act together and deliver? So that wimpy solar, and windmills would be the best mankind has come up with? Let me rephrase this question a little: do you imply that 3 billion allocated towards climate fund is better investment than 3 billion spend on artificial leaf research? This is absolutely realistic. The global CO2-emissions are already leveling off and major emitters as China, USA, EU and Russia are (slowly though) reducing their emissions https://drive.google.com/open?id=0B19Sr_Qmr4GJVlg2Ym13UFFBeUE. The good thing with CO2 pricing is that is very transparent. The consumer costs of subsidies and other politically created incentives are more difficult to identify through the tax system. An other good thing is that it directly hit people with high CO2 footprint while poor people (no car, no air travel, no air-condition) get a break. Thanks to Stefan and Anders for laying this out clearly, especially with regard to tipping points. @3 “Do you seriously believe that fusion folks won’t get their act together and deliver?” They already have. We make regular use of our fusion-powered linear clothes dryer, the one with the specially designed torsion clasps composed of microstructured biopolymer. Other developments are proceeding rapidly. If you were referring to Earth-based fusion, that’s a different story. The delivery time for working fusion is somewhere between a generation and never! That’s a bit late to be helpful. Experimental models require tritium, a byproduct of nuclear reactors, and the intense neutron flux used to generate heat renders ordinary substances radioactive. That’s tolerable for a one-shot experiment, but incredibly expensive and dangerous for a continuous process. It seems silly to say “global CO2 emissions have not increased for the past three years” because the natural carbon cycle has been destabilized and the total picture of the CO2 and CO2e is not captured by discussion that only discusses fossil fuel emissions. If the permafrost thaw caused by fossil fuel emissions is already to release relatively large amounts of CO2, NH4 and NO2, then any reasonable discussion of our global situation has to stop limiting the discussion to fossil fuel CO2 emissions and start evaluating the true global situation with regard to the planetary carbon cycle and the global warming of all the greenhouse gases. I appreciate this post, but it is a little rosy, is it not? Dr. Mann said in 2014 that we need to keep the CO2 level at 405 and under. If he is right (as I think he is), then discussion needs to give up on future emissions processes and switch to discussion of how and how fast we can get back to 405. People have talked about fusion potentially coming on line as an energy source since the 1960’s. The problem is control of the fusion process, which seems horrendously difficult. My expectation is that if practicable it will be expensive. Also, the energy chambers become radioactive over time so there is a disposal issue. And why do you act like the $3B dollars for climate fund is necessarily a loss for renewable energy research. In 2015, the US budget was $3800 billion, and if we got serious we could find much more than $3B. For FY 2016 the DOE budget request for all of energy efficiency, renewable energy, and nuclear energy was $4B. When was the report, “2020 The Climate Turning Point” published? I think throwing a trillion at something we know will work and something that we already know how to do would be a much better than throwing a trillion at wind farms and climate politics. We already know how to do contraception, so … what’s the problem? i.e., a factor of 7. That, to most people, is quite vague. TN 3: do you seriously believe that fusion folks won’t get their act together and deliver? BPL: Absolutely. Fusion power has just been five-ten years away for more than sixty years now. It may well be a dead end. TN: So that wimpy solar, and windmills would be the best mankind has come up with? BPL: They are hardly wimpy. Solar and wind together now provide 6% of US electricity, and that figure is closer to 30% in Denmark and a few other countries. In any case, we don’t need extravagant amounts of power, we need power appropriate to running our civilization. Kardashev’s silly scale of civilizations is long obsolete, and it never did make much sense. It is not feasible. It will not happen. Can we have some realism please? re “- but realistically only if global emissions peak by the year 2020 at the latest. It will not happen. Can we have some realism please? About? Isn’t this supposed to be a scientific article where ‘data accuracy’ is paramount? Well obviously and unfortunately it is not. Global Temps 1880-1920 base period = +1.24C in 2016 ….. Well, isn’t it? According to the above article’s ‘opinions’ much of the CSAS data is wrong. Is it? re: “Fig. 1 Tipping elements in the Earth system ….” Permafrost melting only starts being a problem @ +5C – you cannot be serious!!! Can we have some realism from Real Climate please? Emissions will NOT peak by 2020 – please stop lying about this and spreading gross disinformation to the public and the media — try peaking ~2040 instead – more likely to be caused by catastrophic climate changes, mass famines, economic collapse and NOT by a UNFCCC agreement to voluntarily cut emissions. re: “…. and there are signs to show we are moving in that direction as global CO2 emissions have not increased for the past three years. Wind-Solar-Geothermal-Biomass accounted for 2.88% of total energy consumption in 2015. http://www.columbia.edu/~mhs119/EnergyConsump/ It’s hardly moved in 2 years – incremental only – it’s not gained any significant share of energy use in the last 20 years. There is NO momentum, there is NO enormous action, there is NO scaled up ambition. This is delusional mystical thinking and NOT SCIENTIFIC RIGOUR. Please stop with the Myth Making and tell the truth about the data and the scientific facts. RE: “…in order to travel down the decarbonisation curve at the necessary pace; the window to do that is still open[x]. There is no window let alone an open one! So, please stop distorting the data, the facts and the truth of this. Please stop lying, exaggerating and dreaming up fictional scenarios about this which are impossible and are not happening now and are will not happen in the near future either! Stop it, juts stop it. Can we have some realism from Real Climate please and not ludicrous alternative universe fictional myths? Where does methane release and nitrous oxides enter into this scenario? This is concerning in the face of the Trump Administration…yet I cannot help but think back of how fringe scientists (such as CEI and AMEG) are going to jump on this issue and say that it’s already too late without looking at how renewable energy’s growth is vastly exceeding even the most extreme economic predictions by groups such as the EPA. But I generally agree with this climate panel’s standing of how the main target should be the fossil fuel industry and not arctic methane notwithstanding what the fringe leans towards the latter. Regardless I think we should still encourage local climate action and the support of alternative political parties such as the Moderate Party and Green Party. But thank you for writing this post regardless; it’s much needed. Many thanks. “Global CO2 emissions have not increased for the past three years” This is too optimistic assumption. I would rather say: “reported CO2 emissions from energy production have not increased much for the past three years”. Emissions from land use, agriculture, aviation, shipping etc. have not stalled. Increased use of biomass is often calculated as zero-emission, which is far from the truth. Also methane and laughing gas emissions are on the rise. I have talked with many climate scientists and: Most of them are not specialists in energy systems etc. and have way too optimistic view about decarbonizing energy production, transport, agriculture and so worth. For the societies to act accordingly we should not give people the idea that everything might still be fine. The task ahead of us is enormous. Let’s keep the assumption realistic. “Initially, Arctic amplification (resulting in late season open water with high absorbance) is a poor match with the timing of solar energy peak input, but the overlap will improve in coming years. Open water in Sep-Oct-Nov is already important to heat transfer from ocean to atmosphere. imho everything is moving too fast for the ‘science’ and ‘scientists’ to keep up. ‘Reality’ has moved past the ability of climate and all related science (eg oceans/reefs/biology) to form viable short term and long term projections anymore. Almost everything coming out these days, like this article, is looking in the rear vision mirror and already out of date by the time it’s first published. Of course many most here will not agree. Fine. Disagree. Regrettably it is already too late. Do the same for the CO2e of 525ppm and you get 2.7C. We have already locked in considerably more warming than the Paris Accord targets. You seem to have a fundamental misunderstanding of where we are in the process. Stabilizing carbon emissions now will merely buy time to develop fusion, artificial leaves, etc. It’s no longer either-or. It’s doing everything we can to preserve a climate in which science or even civilization on a global scale is actually possible. Look at where India is now–with farmers committing suicide when the monsoon rains fail–that’s where the rest of Earth is in 20 years. “With May in the books, it’s official: carbon dioxide set an all-time monthly record. It’s a sobering annual reminder that humans are pushing the climate into a state unseen in millions of years. This is not unexpected, but it is a stark reminder for anyone who wants to actually track the accumulation of CO2 in the atmosphere that we are nowhere near a time when we will actually stop pushing this critical number higher. That is the ballgame. More CO2 in the atmosphere, more heat, hotter and more acidic oceans. Let’s put some lipstick on that pig, shall we? It would only take less than 1m average slr + storm surge to render many coastal areas uninsurable. We’ll end up well above 600 Gt I am afraid – for much too many people global warming is not more than a news item, a kind of running gag. People do what the people they know do, a bit varied. GW is not connected to personal wellbeeing in the short or medium term. There is no developed feeling of responsibility for the earth as a whole yet. This is a new situation in the history of mankind, to bump into the limit of growth. We are not used to it, we haven’t learned to deal yet. This does not mean we should not fight for each ton less. E.g. by funding girls primary and secondary education, which has been shown to be very cost effective in respect to population growth, if not general human welfare. A lot can be done by personal example – do good and talk about it. E.g. i do live in germany on about a quarter of electricity of the average german. Very easy to do. Yep, counting on that to happen has been a reliable approach to resolving problems, for millenia. Flattening the Keeling Curve (stabilizing the level of CO2 in the atmosphere) seems unlikely over the next decade, doesn’t it? Power plants, airplanes, shipping, trucking, cement and steel production, cars – all are committed to continued rates of fossil fuel combustion over the next decade. A fully electric solar/wind/storage-based electricity production system is possilble; so is a completely electric car/truck/rail transport system (shipping and airplanes will likely require carbon-based fuels, although that could involve renewable carbon fuels, i.e. fuels synthesized from atmospheric CO2) – but the costs for a global transition would be immense and no government or corporate entity seems willing to do this on the scale required. (As far as nuclear, under current technology trends, solar and wind is cheaper than nuclear – and no risks of meltdown nor problems of high-level radioactive waste. Fusion is a pipe dream 50 years out, perpetually). Flattening the Keeling Curve will become progressively harder as the permafrost melt feedback kicks in, reducing the ability of the net global land system to absorb any more atmospheric CO2. The estimate is that about 50% of total global fossil fuel emissions over the past 100 years have been absorbed by the land and oceans, right? This land/ocean sink’s future is uncertain. If the sinks are exhausted or overwhelmed by permafrost or shallow marine sediment outgassing, then it’s possible that a 50% reduction in the use of fossil fuels, in the worst case, would have no effect on the growth rate of atmospheric CO2. Amount and timing of permafrost carbon release in response to climate warming, Tellus 2011, Schaefer et al. Whether or not you*’re expecting a reply, let me rephrase the question again: Why do we allow the “free” market to drive the large-scale transfer of fossil carbon from geologic sequestration to the climatically-active pool, while externalizing the marginal climate-change cost of using it for energy? Now let me ask you* a new question: do you* seriously believe that if an appropriate carbon price is internalized, as by a national Carbon Fee and Dividend with Border Adjustment, the ‘invisible hand of the market’, namely the necessity of thrift for consumers and the lure of profit for entrepreneurs, won’t drive the transition to a global carbon-neutral economy with alacrity? The Paris Accord temperature goals are not the same thing as the Paris Accord emission reduction goals. My understanding is that IF every country meets their self-determined emission reduction goal, then temperatures will hit +3.7ºC at 2100… and that is being optimistic (i.e., things don’t get worse faster than expected, even though they are getting worse faster than expected). Second, there are no scenarios that keep us close to +2ºC warming that don’t include massive amounts of CO2 Direct Air Capture (DAC) from the atmosphere. There were a few scenarios that didn’t require DAC, but they assumed peaking emissions in 2010. And the amount of “negative emissions” required (starting around 2050) is on the order of 10 gigatons-CO2 per year (and that is also being optimistic). That’s more than the oceans sequester every year! It will be possible to implement DAC on a massive scale (after all, we have already implemented a system that releases 40 GT-CO2 per year into the atmosphere). But will will need to quickly put the proper incentives in place… a rising price on carbon. Does anyone seriously see any way that global emissions can drop rapidly to zero in the next 20 or 30 years? Anybody? Buehler? It. Is. Not. Going. To. Happen. No offense, but are you kidding me????? THIS is the best you can do as a front page for this website??? It has absolutely NO information on landing about the dire situation the planet is in!! There should be a graph or alarm or SOMETHING on your front page that expresses the BASIC conclusion that climate science is REAL!!! GET YOUR ACT TOGETHER. PLEASE!!! The theoretical maximum for chlorophyll efficiency is 11%. The practical maximum is much lower. Why would you want to go that route. Do you seriously believe that the “fusion folks” will be able to deliver on fusion, at any point in the future? When do you think that will be? And how do you know that the warming built in before the world switches entirely to fusion energy for everything will not continue to cause sea levels to rise for centuries? “Artificial leaf research”? This is technotopian thinking. The safest approach is to assume that all of the fancy solution ideas will never come to fruition or not at a scale or within a time that will stop warming at some safe level. And don’t get me started on the environmental damage civilisation has already wrought even before climate change has really kicked in. Do we really want that to continue? How do you intend to prevent Republicans from lying themselves back into office? Are you going to trust the intelligence of the American people, who have just proven themselves to be most probably the dumbest people on earth? Today I learned from Republican Charles Krauthammer that America invented the steam engine, and that America should not apologize for doing so. Model T introduced 110 years ago. We’re still using the same engine: hot, “smelly”, complex, inefficient. Say fusion is available in 50 years. Under business-as-usual, where will the sea level be? Up 1 metre? To avoid the manure, we can develop solar and wind, or put the cart before the horse. Isn’t this supposed to be a scientific article where ‘data accuracy’ is paramount? Data “accuracy”, although highly desirable, is not paramount in science. The concept of uncertainty is fundamental. Unfortunately, it is a concept that most people don’t appear to understand. Does anyone seriously see any way that global emissions can drop rapidly to zero in the next 20 or 30 years? Of course, we can watch global temperature continually rise as inadequate action continues. Starting at 1.1 degrees C (on trend) now, we would expect to reach 1.5 degrees in about 20 years and continue rising after that. For limited values of “few” — I believe Tamino has done the arithmetic on this claim and says otherwise. But if you read the entire article, you know that the WAIS is not the only flashpoint. Are you sure we’re talking centuries when you factor *all* the melting in? KIA 15: The sky is falling! The sky is falling! BPL: Actually, global warming lifts the tropopause. Th 19: imho everything is moving too fast for the ‘science’ and ‘scientists’ to keep up. BPL: What would you prefer to science? The opposition to dirt cheap energy here is strong, but let me get a second try for a convincing argument. Let’s first remove any confusion, dirt-cheap energy means abundant supply and 0 cents per kWh. Zero is the limit number, of course, and an interesting discussion may explore what new developments can be facilitated at price levels 1 cent, 0.1 cents, 0.01 c, and so on. For example, at some price threshold desalination becomes cost efficient. Then, one can irrigate the whole Sachara desert and Arabian peninsula. Given that water deficit it one of contributing factors to poverty and political instability on Middle East, what is not to like? It is remarkable how puny people and heavy machinery look at this scale. For the record, there is nothing there powered by wind and solar. #34 Mike “The safest approach is to assume that all of the fancy solution ideas will never come to fruition…” This is pretty gloomy view of the world. Extending your idea, [celestial] solar energy output would slowly grow rendering Earth not inhabitable somewhere 1B years into the future. I bet humanity will find some “fancy” solution long before that deadline. And who do you think is in position to calculate “true” cost of carbon? Some climate bureaucrat? Excuse me, but their achievement record has been less than stellar so far. Hence, the “social cost of carbon” program has been cancelled. It is remarkable how skewed people priorities are (they always were, but still). 15 February 2013 there was 400–500 kiloton explosion above large Russian city. Do we need Tunguska level event to get attention to this problem? A different possibility is some nut job detonating a nuclear device in Manhattan. In a word, there are serious issues out there, while our resources are not infinite. Don’t oversell your stuff. Yes. It looks good. But if there was a reactor design available today it would still take 20 years to bring each mew generation of fusion plant on line. The current generation will not live long enough to see the first commercial fusion plants come on line, so Fusion will offer no solution to the warming problem. Look at where India is now–with farmers committing suicide when the monsoon rains fail–that’s where the rest of Earth is in 20 years. Ray Ladbury, as far as I am aware, the farmers commit suicide when the monsoon rains fail because they are deeply indebted to large corporations that sold them “modern” methods of farming, instead of relying on their traditional sustainable methods, their own seed, etc., etc..
45 tegiri nenashi says: with inexpensive abundant energy we can move mountains. Yes, I’ve heard faith can move mountains. Nat King Cole did the calculations.